But the town does have its aristocratic side. Up along Sixth Street – once known as “Silk Stocking Row” – stand the ornate homes of the lumbermen and manufacturing barons who flourished here during the last half of the 19th century. And the biggest of them all is the mansion of the city’s founder, Perry Hannah. Millionaire, politician and benevolent despot, Hannah is also the man responsible for the town’s easygoing social atmosphere. The house, at 305 Sixth St., was started in 1891 and finished two years later (30 to 60 carpenters worked on it). of golden oak with a small “Romeo and Juliet” balcony, is worth a peek inside all by itself. 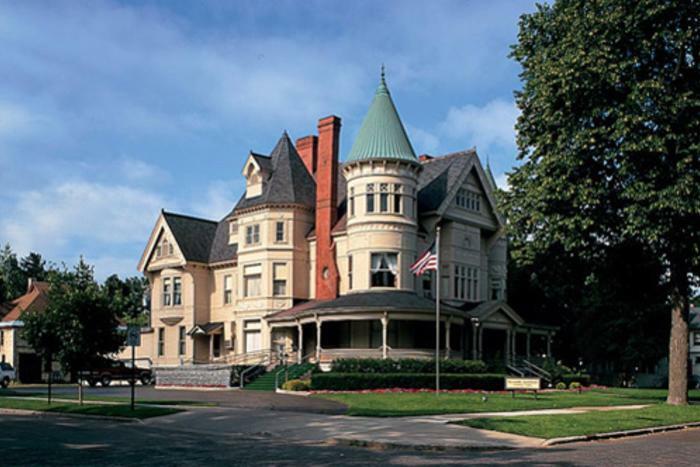 Today the massive four-story mansion with its 34 rooms is a local funeral home. Like its neighbors, the house is perched on a high bank overlooking the Boardman River, where 400 million board feet of timber were floated down to Hannah’s waiting sawmills and ships – lumber that helped settle the treeless western plains and rebuild Chicago after the Great Fire. But Hannah wasn’t content to simply cut down trees and haul them off to market. He wanted to create a community. “The natural beauty of Grand Traverse Bay charmed him, and unlike many of his colleagues he wanted to build something lasting on that,” wrote author George Cantor. Born near Erie, Pa. in 1824, Hannah moved to Chicago as a young man and partnered up with a New Yorker named A. Tracy Lay. In 1851, at the age of 27, he sailed into Grand Traverse Bay with Capt. Harry Boardman of Naperville, Ill., who had bought 200 acres of woodlands along the shore several years before, and had sent his son to start a sawmill there. When Boardman found the men sitting outside the silent mill playing cards instead of working, he was so angry that he sold the whole thing to Hannah for $4,500. That 200-acre parcel was the start of Traverse City. Within a few years, a small colony of about 50 lumberjacks and millworkers had gathered around the mouth of the river, and Hannah started a store and boarding house for them. In less than a decade, the Hannah-Lay Company grew to include a fleet of ships, a bank, a grocery store, a hardware store, a furniture and clothing store. 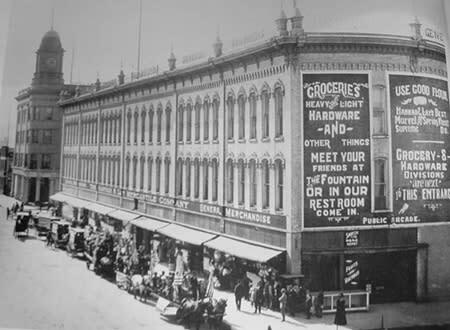 Eventually, all the stores were gathered under a single roof in a huge brick building – the Big Store – that stretched for two blocks and was the largest department store in the north. While his partner preferred to stay in Chicago, Hannah fell in love with Traverse City and made it his home. At first, the growing community was a classic one-man company town – but Hannah was determined to change that as quickly as possible. Unlike other men in a monopoly position, he refused to extend credit to his workers; he felt it would make the goods he sold more expensive and could easily trap his employees in a cycle of debt they could never get out of. And he believed in the power of competition so devoutly that he often helped former employees start businesses of their own – even knowing that they would eventually compete against him. Hannah also knew that an economy based on the exploitation of a single raw material couldn’t last indefinitely. Early in his career, he began converting his sawmills into flour mills to encourage agriculture, and lobbied the state government to locate an asylum for the mentally ill in Traverse City – knowing that it would provide hundreds of new jobs for displace lumberjacks and woodworkers. 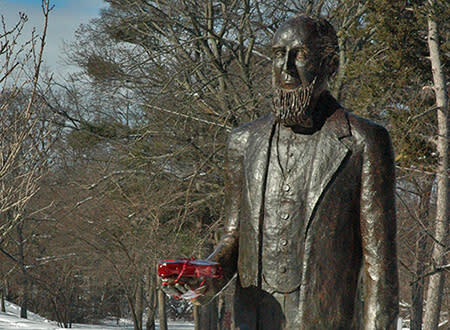 What’s more, he opened the region to the wider world by making sure there were roads – and eventually railroads – to connect it to the rest of the country. (It’s hard for modern visitors to realize that until 1863, the town could only be reached by boat; the first railroad spur didn’t reach here until 1872.) 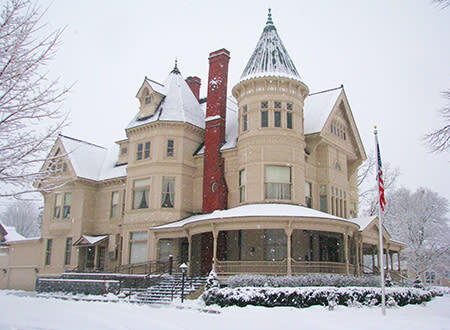 Knowing that tourism would eventually be an important industry, he purchased and refurbished the old Campbell House, which is now the Park Place Hotel. The Hannah House is now the Reynolds-Jonkhoff Funeral Home. Owners Dan and Peg Jonkhoff are very conscious of the building’s historical importance and very gracious about letting folks in to look around as long as there’s not a funeral going on – but it’s crucially important to call ahead at (231) 947-6347 to avoid conflicts. On Saturday, Dec. 10 from 4-7pm, the house will be open to the public for a Holiday Open House, decorated for the holiday season and filled with more than 20 decorated Christmas trees that have been collected over the decades from family, friends and various community events. Special music will be provided at 4 pm by TC Celtic whose members include Dane Hyde, Dave Martin and Don Shikosky , and at 6 pm with Rick Harkert at the keyboard playing Christmas songs. Derek Woodruff will present a floral demonstration entitled "Bohemian Christmas" at 5 pm. Local authors will sign books, refreshments will be served and more will be enjoyed during this unique event. Admission is free, but guests are invited to bring items for a local food pantry or an unwrapped toy for Toys for Tots to place under the main floor Christmas tree.